Broughton room has a queen bed, own ensuite with a large balcony with sun lounges overlooking peaceful bushland reserve. The room has Flat TV, Foxtel, A/C, Ceiling Fan, Bar Fridge, Tea and Coffee facilities, with the tariff including a great breakfast of cereals, fresh fruit salad, yoghurts, juices and our homemade breads. Yacaaba room has a private enclosed balcony (Waterproof SunShade for roof) with a 2 person Spa overlooking bushland reserve. Table & Chairs on balcony. The room has own ensuite, A/C, Safe, Flat TV, Foxtel, Wireless Inernet, Ceiling Fan, Bath Robes, Bar Fridge and Tea and Coffee facilities. Great room for privacy and those wanting some romance. Candles provided. Tariff includes a great continental breakfast of cereals, fresh fruit salad, yoghurt, juices, coffee/latte, etc and our homemade bread. 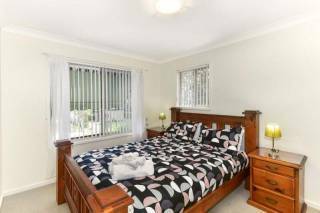 Tomaree (Spa) is a beautiful room, great for those looking for a little romance. The private enclosed balcony has a 2 person sunken Spa, table and chairs and is open at the top to one side for you to view the stars. Candles provided. The room has an ensuite, Flat Tv, Foxtel, A/C, Bar Fridge, Bath Robes, Safe, Tea and coffee facilities, Ceiling Fan. Tariff includes a great continental breakfast of fresh fruit salad, yoghurt, cereals, juices, coffee/latte, etc and our homemade bread. 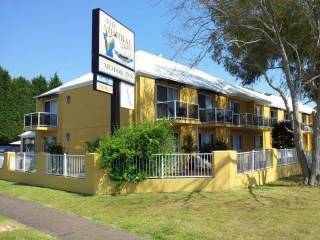 - Three Queen rooms, each with Ensuites, A/C, Ceiling fans, Bar Fridge, Tea and Coffee facilities, Flat TV, DVD Player, Cable (Foxtel) TV and Free Wireless internet. - A delicious Continental Breakfast including Cereals, Fresh Fruit Salad, Yoghurts, Juices and our Homemade Bread for Toast (Gluten Free and Soy Milk available) is included in your tariff. Cooked Breakfast is available at additional cost. 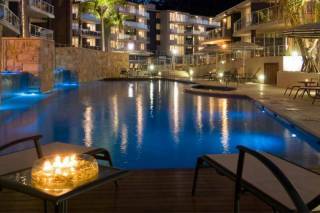 - Two rooms with private enclosed balconies with 2 person Spa. 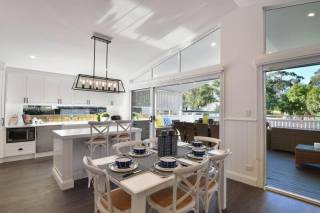 One room with private balcony overlooking bushland setting. 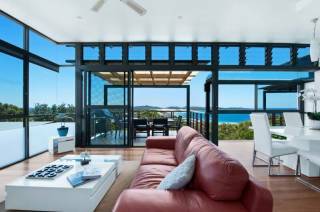 - Separate guest facilites and a living/dining area with a cosy fireplace for cool nights as well as library of movies for you to view. - BBQ with oven/hotplate, Microwave, Refrigerator, Coffee machines for latte/cupaccino's, teas and hot chocolate. -Office, Free Wireless internet, printer and photo copy facilities. -Off Street Parking, Tour Booking with discounts, Gift Vouchers. We are only a ten minute walk to Marina, town center. 1st night deposit required to confirm a booking, Cancellations at the discreation of owner and to be advised 30 day prior to checkin. Xmas, Easter, Public holidays, School holidays 60 days notice is required. An accounting fee of $10 is payable on any cancellations. Possibility of changing dates with no penalty if advised 30 days prior. Follow Nelson Bay signs on Pacific Highway into Nelson Bay, shortly after entering the 60kph zone you will pass the lookout on your left (Lily Hill Road); 1 km later, you will enter a 50kph zone, 200 metres from here there is a right turn into our street. Stockton Street & Blue B&B sign will be at this turn, as you enter street there is a “no through road” sign, we are at the end of this street, turn left into driveway where you will see 3 marked parking bays. Nelson Bay is situated in Port Stephens. 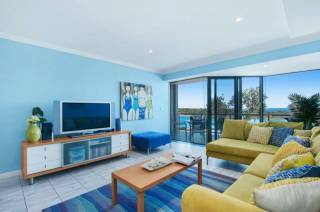 The natural setting of Port Stephens offers an endless range of attractions and activities. Whether you are after thrills, want to enjoy yourself at your own pace, or do nothing at all, Port Stephens is the place to visit. This blue Water Paradise is famous for dolphin-watching. Approximately 160 bottle-nose dolphins live year round in these pristine waters. Cruise boats leave several times each and every day of the year. From May to November whale watching is an experience to remember. Cruise boats leave morning and afternoon to allow tourist to witness the migration of more than 6000 humpbacks annually. What else – 4 wheel driving tours, Quad Bike or camel rides on the Stockton Sand dunes, kayaking, scuba diving and snorkelling in Marine Park, horse-riding, parasailing, jet skis, boat hire, cycling, bush walking, wineries or wine tours, there is something for everyone. Trish can help you with advice on these tours, (discounts on some tours), ensuring your stay is a truly unique experience in the fabulous area of this Blue Water Paradise.